"Captain of the Ship Doesn’t Jump into Water"
Syrian President Bashar Assad called out Western media for vilifying him while at the same time whitewashing terrorists as “freedom fighters” to paint a “black-and-white” picture of the war in Syria, as he pledged to not leave office until his term expires. Assad spoke on Syria’s and his personal future as the country’s leader at the meeting with US media that took place in Damascus on Monday evening. Reflecting on being labeled a “war criminal” by the mainstream media, which attribute the death of thousands of civilians to the Syrian government’s anti-terrorist campaign, he said that the support he still enjoys with the Syrian people after over five years into the conflict does not fit into this narrative. “Let’s suppose that these allegations are correct and this is a president who is killing his own people and committed crimes, and the ‘free world’ and the West is helping the Syrian people against the bad guy,” Assad said, as cited by the New Yorker, adding that if this was the case, he would have lost all public support a long time ago. “How can I be president if I am killing my people and my people are against me? This is disconnected from reality,” Assad added. He pointed to a lack of media attention toward the terrorists’ atrocities in Syria, with “no one talking about war crimes” committed by militants fighting against the Syrian Army. “The headline is ‘The bad president, the bad guy, is killing the good guys. They [the terrorists] are the freedom fighters,” the Syrian leader said, lamenting what he said was distorted, “black-and-white” media coverage. Assad said he believes he should serve his seven-year presidential term, which began in 2014 after he claimed a landslide victory securing almost 90 percent of the vote in presidential elections, in full, not to betray the trust of the people who cast ballots for him. “If you’re the captain of the ship, when you have a storm, you don’t jump in the water. You lead it to shore,” Assad said. 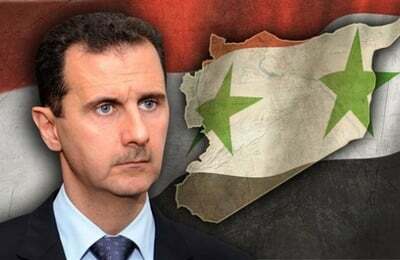 Assad argued that many of his political opponents who previously opposed the ruling Ba’ath Party have taken his side under the circumstances of wartime as they fear Syria’s statehood might be dismantled and jihadists will take over the country in case his government collapses. While the mainstream Western media was quick to blame Assad for war crimes for what they claimed was indiscriminate bombing campaign in eastern Aleppo, the Syrian president responded by citing international law violations committed by the West such as the Iraq invasion and chaos in Libya, which is still reeling from its civil war and is currently on the brink of economic collapse. “We’re not the ones who attacked Iraq without a mandate from the United Nations – it was the United States and Britain and her allies. It wasn’t us who attacked Libya and destroyed the government,” Assad told the New Yorker, adding that Western powers have no right to intervene into the internal affairs of countries if they don’t like the political course their government follows. “Even if you have the worst government in Libya, it’s not your mission, the United States or any other government, to change the government of foreign countries,” he stressed, adding that that a similar threat is hanging over Syria, as he believes the US in Syria is aimed not on fighting terrorism but rather on ousting the Syrian government. “In reality, everything the United States has been doing in Syria, at least since what they call the international alliance against ISIS [Islamic State], is to expand ISIS. The real reason is about toppling the government,” Assad said. Assad believes that one of the crucial moments for Syria returning back to normal life will be underpinning the secular principles of the state, while simultaneously uprooting ideas of radical Islam that rejects any other worldview. Assad also explained that Syrian government has not cut all ties with the West, and carries on a dialogue with some Western countries, including with the US, “through different channels.” However, he stressed that Syria has no intention to turn into “a puppet country,” The New York Times quotes. Commenting on Assad’s statement, John Kirby, spokesperson for the US State Department, reiterated the US position on the Syrian president staying in power, insisting that Assad must not be a “part of the long-term future of Syria” and adding that “nothing’s changed” in the American administration view on the issue.